…to the Republican party on taxes? 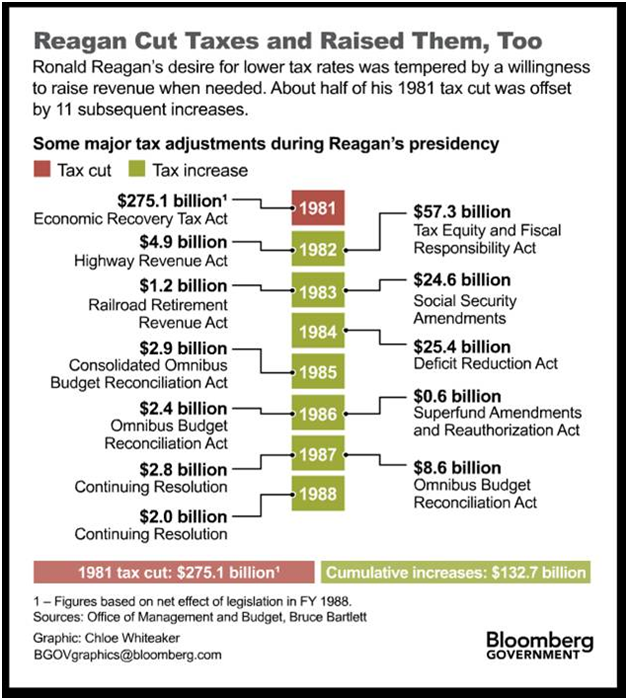 Yesterday I stumbled on the figure below re Reagan’s tax record at around the same time we got the TPC score of the Cain 9-9-9 tax plan. The party may revere Reagan, but they definitely wouldn’t recognize each other if they met at a tax policy conference today. Nor would the gipper last for long on the R’s side of the deficit-reduction super committee. Recall from work done by my CBPP colleague Kathy Ruffing that 82% of the savings in the 1984 Deficit Reduction Act came from revenues. –Hyper-Inequality Syndrome: The average level of income inequality (percent going to top 1%) from 1980-89 was 12.6%; from 2000-08 it was 20.3%. That’s an increase in over $600 billion to the richest households (using most recent Piketty/Saez inequality data). As I noted yesterday re the Koch brothers’ support of Herman Cain, these investors expect to get something for their money, and we should thus see a positive correlation between income concentration and regressive tax proposals. Which we do. –YOYO Syndrome: Conservative economics is increasing YOYO (You’re On Your Own) economics. Privatize, voucherize, disinvest in the public sector, and shrink government all under the rubric that private markets are more efficient, self-regulate, do not fail, and generate better outcomes in this best of all possible worlds. In practice, YOYOism has delivered a large shift in the locus of economic risk from gov’t and firms to households. But in theory, in YOYO world, you need to keep all your money for yourself. Note, however, that this doesn’t explain the increase in taxes on the bottom 84% in the Cain plan. I’m not saying I miss Reaganomics…I don’t. But he wouldn’t have gone there. –Government Is the Problem: This, of course, started rhetorically with Reagan himself, but it has gone viral in the worst way. There are two reinforcing dynamics here with regard to taxes. First, as middle-class and low-income family incomes have declined in real terms, the idea of sending money that you need to make ends meet to politicians to spend on their boondoggles is…um…distasteful. And then there’s this: if you are of the party that believes that gov’t is the problem and want to make that point abundantly clear to all, then, when you are in power, you will do your best to prove that gov’t is the problem. For example, you might waste valuable months fighting about the debt ceiling and threatening default, at a time when most Americans want and need you to do something about the economy. And in so doing, you fulfill your prophecy that gov’t is the problem, and families should not throw their much-needed good money after bad. Hmmm…When you lay it out this way, it actually doesn’t seem so daunting: we need less inequality, no electing anyone who pledges to anything other than the flag, a re-shift in the locus of risk from YOYO to WITT (“we’re in this together”), and a renewed understanding of the need for an amply funded and properly sized federal gov’t in an increasingly challenging world. Share the post "What Happened…"
6 comments in reply to "What Happened…"
What I find particularly weird is how schizophrenic they’ve gotten over the tax-the-poor issue. We had a round of the WSJ’s lucky-duckies meme, with Bachmann saying that “everyone should pay something, even if its just a dollar.” And then more recently, when folks have decided that they need to pull Cain down from his new contender status, they’ve decided to embrace the traditional Democratic position in favor of progressive taxes. I suppose it shouldn’t come as a surprise that these people will say absolutely anything to get elected and have no intellectual coherency, but for Pete’s sake, could they at least fake it a little? I believe the party you are referring to Jared was acquired back in the mid to late ’70’s. I think the highest bidders were the Scaife’s – Koch’s joint venture. I don’t recall the exact value of the transaction but it turned out to be the best investment they ever made. By the standards we have today – Ronald Reagan would be a bleeding heart socialist. Sounds bizarre, but yet it would be true. There are places where he simply would not have gone. I was no fan of Reaganomics – but it actually looks GOOD in the present context of “lucky duckie” and “tax the poor” politics. Perhaps we should bring back serfdom. …seems the social contract has something to do with it…dems have one with the people…the rethuglicans have a contract on the people. Raygun was still a spitter…but these guys are swallowers. They drink deeply from the pool of solipsism…you know, the disease that allows self definition. The “government is the problem” meme is really pernicious, and this latest filibuster on the jobs bill is more proof that Republicans actively seek to reinforce that distrust of gov’t, even when the victims are teachers and first responders (not to mention the demand-challenged economy as a whole). Something is radically wrong when and entire political party is willing to abandon its Constitutional oath of office for a pledge by someone who has never worked a day in an honest, productive job.